Who's up for some crispy pufferfish? If a chef offered you a dish that included “paralyzing toxins” that “could suffocate you,” you probably wouldn’t eat it. But that’s the sort of choice people suffering from food allergies endure every day. A new campaign from nonprofit End Allergies Together (or E.A.T.) and BBDO New York seeks to raise awareness of food allergies—and money to research possible cures—by illustrating the harsh reality that, for people suffering from food allergies, one bite of the wrong food can be deadly. 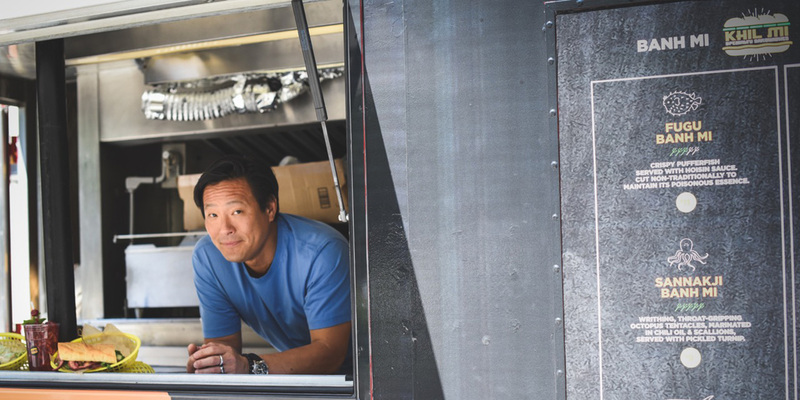 To that end, the agency teamed up with celebrity chef Ming Tsai to create a food truck that offered non-allergic eaters a taste of the allergic experience—by serving up poisonous dishes. In a PSA set to air in movie theaters starting July 28, Tsai mans the gourmet vehicle, titled “Khil Mi,” while offering passersby dishes that include ingredients like toxic yew berries, and other components that might cause shortness of breath or heart failure. The truck was set up in New York City, in what looks like a small public area across from Madison Square Park (a bustling commercial area where food vendors often hawk their wares). As an attention-grabbing stunt, it’s effective, even if the exchanges themselves are staged (as such productions usually are, to some degree). “Have you had anyone die on you?” asks one customer. “Not this week,” says Tsai. And if it seems melodramatic, it’s not, entirely. The PSA is dedicated to Oakley Debbs, an 11-year-old who died last year after accidentally ingesting a walnut, despite having been diagnosed only with a mild allergy to nuts—and to other fatal victims of food allergies. While accurate comprehensive numbers are hard to come by, the risk of dying from anaphylaxis—or severe allergic reaction—is statistically relatively low (about 225 people a year, according to one 2013 study also including non-food allergens). But some 17 million Americans suffer from food allergies, and 220 million around the globe, says E.A.T. And the risk to even a single child is understandably disturbing. Founded in 2015 by Kim Hall and Elise Bates—both parents to kids with life-threatening food allergies—E.A.T. has raised $1.4 million for studies seeking treatments.